We estimate that OPEC production was down m/m by 0.36 mb/d to 31.67 mb/d in December. In y/y terms, output was down by 0.54 mb/d. Following Qatar’s decision to quit OPEC from January 2019, we have now moved the country to our non-OPEC balances. Saudi Arabia started cutting production even prior to the OPEC+ agreement to reduce output by 1.2 mb/d from January. After reaching a record-high 11.1 mb/d in November, Saudi output fell m/m by 0.45 mb/d to 10.65 mb/d in December as demand for Saudi crude fell following the US move to grant waivers to eight importers of Iranian crude. The Kingdom has announced it will further slash output to 10.2 mb/d in January, some 0.9 mb/d lower vs November, and thus over-complying with its new production target of 10.3 mb/d. 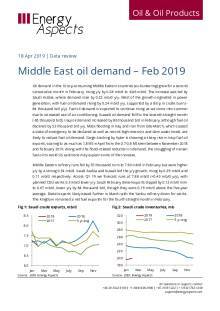 Elsewhere last month, Libya’s output fell by 0.15 mb/d m/m to 0.85 mb/d following the closure of the Sharara oilfield at the hands of local protest groups. The field was still closed by mid-January and the risk of a prolonged closure is rising as the forces of Khalifa Haftar close in on the facility. In the UAE and Iraq output rose last month. The Emirati authorities boosted output m/m by 0.11 mb/d to 3.33 mb/d, although this was still below the 3.5 mb/d that they claimed to have hit it December, likely partly due to Iranian waivers curtailing demand. From January, UAE’s output will fall to around 3.08 mb/d according to our estimates. Iraq raised production m/m by 60 thousand b/d to 4.64 mb/d thanks to rising exports from Kirkuk and the Basrah terminal after the end of loading disruptions in November. However, we expect the Iraqi authorities to reduce production to 4.58 mb/d in January, as the country complies with its new output target. The average of third-party estimates we collect shows OPEC output falling to 31.81 mb/d in December. The main differences with our estimates is 30 thousand b/d m/m decline in the UAE’s output to 3.24 mb/d, while we estimated a sizable m/m increase to 3.33 mb/d. Following the adoption of the new OPEC+ deal in early December, we expect total production to fall to 30.82 mb/d in Q1 19, down from 31.9 mb/d in Q4 18. Compliance with the agreement will be ensured by Saudi Arabia and Iraq, which will respectively reduce production to 10.3 mb/d and 4.56 mb/d in Q1 19 from 10.81 mb/d and 4.6 mb/d in Q4 18. In Q2 19, total OPEC output will remain around 30.81 mb/d, as compliance will remain strong through the end of H1 19. The April OPEC meeting will decide whether or not to extend the deal into H2 19, but we factor in a slow increase in output from OPEC members—we see them adjusting their stance based on the evolving market fundamentals and we also see the need for OPEC oil amidst higher world runs.